There is no doubt that when a person becomes a blogger, his/her very first goal is to get Adsense approval so that he can make money from blogging. But Adsense is not the only way a person can monetize his/her blogs. I have many blogs on which Adsense is working great. But today I am going to share how I made $12,000 this month even without Adsense. If you have any doubt than check this also : is it possible to make money without Adsense? Like previous months, this is the time, when I share my blog traffic and earning report. Publishing monthly income & traffic report not only help to motivate but also shows transparency. From last few months I was so busy in everything that I was not able to share monthly income reports. 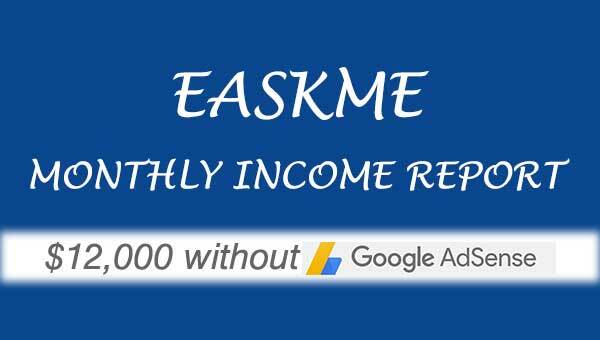 But now I am sharing my eAskme income report of August 2016, but in this report I am not including the earning of Adsense. August was a good month in terms of money and followers. as I got various sponsored posts which helped me make over $2300. Also my blog consultancy service and Ultimate Premium Lifestyle course has helped me to earn a lot from new blogs and websites. I also like to share a good news with all my readers that I am building a new house which is actually gonna cost me $50,000 USD. In September, I am more excited to make more money blogging, as you know building a house octs good money. It is always necessary for a blogger to keep learning and keep implementing new things. eAskme team is working on new eAskme. You can subscribe to eAskme Email newsletter or like us on facebook to stay tuned with updates and offers.